Ladies and gents, it’s football season. This requires 2 things: a TV and chili. I have made many chili recipes, each one different than the last. This one, however, is the only recipe I’ll ever use again. I wouldn’t have thought to incorporate peanut butter into chili except that there is a widespread tradition amongst some people to serve peanut butter with chili, either on crackers or peanut butter sandwiches. I’ve had several people tell me that no chili could beat their recipe, yet every time they reluctantly admitted that mine was better. Last year for the Super Bowl, each of our guests said it was the best chili they’ve ever had. And if you read some of the comments below, people have entered this recipe into chili cook-offs and won! At this point, you shouldn’t need any more convincing – make this chili now. I’ve also got more great Super Bowl recipes below. 1. Add some olive oil to a very large pot and cook onions and garlic over medium-high heat until onions are translucent. Add ground beef and turkey and cook until browned and cooked through. Drain fat from bottom of the pot. 2a. If using a slow cooker, add everything to the slow cooker, stir well and cook on low for 6+ hours. You may want to break “crockpot standards” and stir once or twice throughout the cook time, since this thick chili can burn a little bit on the sides (however, the burnt bits are pretty tasty). 2b. If using stovetop, return the pot to the burner and add everything. Bring to a boil, cover, reduce heat and simmer for at least 2 hours, stirring occasionally. For all Super Bowl Recipes click here! Are you freaking kidding me?!? Can I come over to your house for the game? Go Cardinals! Oh my gosh, yummy delightful eats! I want some! I want a spread with all of those delicious goodies! Those raspberry brownies look amazing! Oh yum. Think I need to have a Super Bowl party just to be able to make all this delicious food. man… I’m going to have to try that… even if it’s not for a super bowl party! That looks SO good. And even more interesting with the peanut butter added. Hey, is this chili “even better the second day around” like most chilis? I wonder if you can crock-pot this… ? Peanut butter in chili? I never would have thought of it, but I can totally see it working. The addition of pumpkin intrigues me as well. I’m going to go for it on sunday. What a great recipe! Thanks for all the other recipes! I haven’t watched a super bowl in many years, but your chili would be a perfect excuse to sit in front of the TV to cheer complete strange teams on Sunday, LOL. Great job! I don’t know … are you sure this is good? I can’t imagine peanut butter in a chili. I really want to try but am a little scared lol. It looks good. i can see how PB would be good in chili – i’ll bet it adds a nice flavor. i am definitely planning a pot of chili for this sunday. yours looks tasty!! Sounds good! I applaud the use of pumpkin as well :] It blends so seamlessly into so many things. Looks great! Good luck in the contest! Peanut butter chili? I think I have died. This is going to taste amazing–I am so making this. another great recipe, Nick. Chili rocks, but I never have it at home with FOB parents. Looks really delicious!! I love adding peanut butter to stews, adds lots of flavours and helps thicken as well. Appetizing spread of game-time food.Adding PB to chili certainly makes it hearty and more nutritious ,love to try it next time I make chili. is this the chili you gave me last weekend? I didnt know that it had PB in it! Thank God you fixed our little viewing dilemma, this chili was calling to me on Tastespotting. It looks incredible, as do your other Super Bowl creations, I’ll have to get cooking this weekend. And I took your suggestion about contacting Katie from Naturally Nutty. She definately brought the goods. Chocolate Vanilla Almond, and some tasty samples (all highly recommended). Thanks for all your advice! The picture looks fabulous and I’ve got to try that sometime! Peanut butter chili sounds good! The pumpkin and peanut butter must make this creamy and sweet, at the same time bouncing off the spice! Love it. I’m assigning my husband to make this. Yummy! Love the pumpkin. Sneaky. what a terrific, extremely unique recipe! have you ever made your own hominy? my grandpa is a pro, and it’s unlike anything you’ll ever buy in a store. Oh my gosh, this looks and sounds amazing! I’ve always wanted to try hominy–this is a good excuse to, right? You’re a chili genius! Nom…NOM! Too bad I’m eating with a lot of people and can’t do beans unless I’m just chillin’ with my spouse…know what I mean? I remember that raspberry brownie post. Oh lord! Great recipe Nick. Your site is looking better and better each time I come by. Great job! Oh my, that PB chili looks amazing. Is that lovely color from the peanut butter? Will have to make some, with double the meat and no beans to lower the carbs. Thanks for another great recipe, Nick! I want to come for everything but especially the chili! Hey,my hubby made an easy treat using PB. Check it out when you can. Hope all is well! Hi Nick! I’ve never used hominy either. Pumpkin puree? Hmm…I’m just not sure about that but I trust you. If you say it’s the best chili you’ve made (hopefully you’ve made more than one?) then I will bookmark it to try. oh my goodness, are you serious? peanut butter chili? okay! well the entire spread looks like a feast for real winners!!!!!! woo hoo Steelers! I agree with his command decision! Let me know the results! Just made it…loved it..added 2 small cans extra of diced tomatoes and a cup a chicken stock..was skeptical about adding peppers at the end..but worked perfect..substituted pork with steak..and added 2 chopped jalapenos..very great..enjoyed by all…thanks! Glad you enjoyed it! Adding the peppers at the end helps keep them a little crunchy, so they’re not completely mushy. I will try steak or ground beef next time and I like the jalapeno addition! I have made this 3 times now and when asked what was in it i told them peanutbutter and pumpkin they are like no way. Did not bring home any left overs. 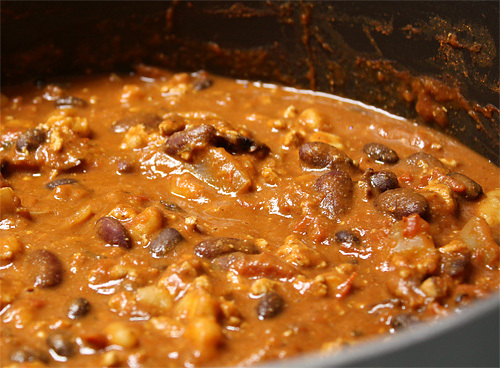 Thanks for sharing this is now the families favorite chili recipe. Good also served as the topping for chips and cheese. Excellent! I’m so glad everyone seems to like it! This really is the best chili I’ve ever made or had, it can’t be beat! I have made this chili a few times now. It is the best Chili Ever. Have been lookin foe a chili recipe some time now with peanut butter. Definately will enter this one in the church chili cook off. Thank you! When I said “this is the best chili I have made”, I wasn’t tooting my own horn but stating a fact! The stuff is fantastic and superbly healthy. I hope you’ll let me know how the cook off goes! Okay, so I have made it and it’s simmering on the stove right now and I have got to say that I am skeptical. It makes a HUGE pot and I am so hoping that it is not a waste of my time and money. I am entering it into tomorrow’s church chili cookoff. I have come in third the past three years. I am hoping this recipe puts me in the winner’s circle but seriously, when adding the PB and the pumpkin I almost threw up a little bit, as it just seems so gross. Almost threw up? That might be the worst review I’ve gotten yet – and you haven’t even tasted it! Although I might have recommended that if the thought of peanut butter and pumpkin make you want to vomit, maybe this isn’t for you. However, the other glowing comments on this recipe speak to the deliciousness, I assure you. And I hope you and Sarah (comment #41) aren’t entering the same church chili cook off or you’ll both be tied for first place! Okay, so we had the chili for dinner and it’s a good solid chili but . . . one question. On the Carrol Shelby’s spice packet – did you add everything? (The masa, all the salt, the spice packet and the hot pepper?) I only used the spice packet (I have to be careful with the heat as most people at the cookoff don’t like it spicy.) Thanks. But the real question – “good solid chili” – what exactly does that mean? Better than an 8 out of 10? Better than vomit? This is ingenious! I never would have thought to combine chili + peanut butter + pumpkin puree, but it was seriously yummy. Even the bf, who was highly suspicious of the unorthodox ingredients, was won over. The only real deviation I made from the recipe was to add a 12oz bottle of Fat Tire (because beer makes everything better). I wish I’d had some Samuel Adams Octoberfest, but alas, we drank all of our reserves. Thanks for the delicious delicousness, Nick! Mmmm, Holly, that’s a great idea! I’ll be adding beer next time for sure! Glad you both enjoyed it! What type of salsa did you use? Good question. Although I don’t remember the specific brand, a simple medium red salsa will suffice, it just adds a lot of good flavor. Just finished making a batch of this. It is the most amazing chili recipe I’ve ever tried, which I’ve made myself. Thank you so much for sharing. For the salsa, I used 2 cans of Herdez Salsa Ranchera. It’s a dark red salsa with a smoky complex flavor that goes well with this chili. Some sriracha sauce dribbled over the top for some heat was also grand. Oh, and I added a tsp of cocoa powder too! Not that it needed it, just something I like to add to chili. Other than that this one’s going in the book. Ah, cocoa powder, I like that idea! I have to find that salsa too, I’ll be sure to try it next time. Thanks for the rave review, I’m glad you enjoyed it! Made this before Thanksgiving for everybody to eat on when they got tired of turkey. I for sure thought that I would have some to freeze. Nope. Everybody loved it and my nieces gave me two thumbs up! I do, however, want to find a way to add a little more depth to the flavor without adding heat. Great recipe! Great news! Thanks for letting me know how much you guys enjoyed it. What Chili Seasoning Kit did you use? Carroll Shelby’s or a different one? I used Carroll Shelby, but didn’t use the heat packet because of my nieces. Maybe just a little more cumin and chili powder? Yes, I would suggest more cumin, chili powder and paprika. And for more depth, you could add some cocoa powder (3-4 Tbsp) and cinnamon (1-2 tsp) too! Another thought. Would sweet potatoes work? You mean using sweet potato puree instead of pumpkin? I’m sure it would be delicious but likely be thicker and add some sweetness to the chili. Definitely sounds interesting, give it a try and let me know! What a fantastic recipe. It sounds wonderful. What size can of pumpkin did you use….small or large? Sorry…I misread the recipe…it is 1 cup of pumpkin puree!! I LOVE this chili!!! It is Awesome!!! Whenever I say I am going to make it…there are cheers throughout the house. It has been at every football game and will be at this weekend for our Super Bowl Party. Actually, I make it at least once a month no matter what is going on.I use a huge pot and transfer it to my crockpot so it’s ready to eat all day, it’s great with Scoops and Fritos. I do use the cocoa powder and add some liquid smoke and brown suger. YUM!!! Thank you for this recipe, my days of looking for the perfect chili recipe are over! Again…Thank You from my entire family!!! Oh my freaking god! This sounds awesome. I already think putting peanut butter in pretty much anything instantly makes it taste better. Why I never thought to put it in chili, completely baffles me. I’ve added cocoa and beer to it, why not my beloved peanut butter. THanks for the great idea. I wish I had seen this recipe before Sunday. I definitely would have made it for my Super Bowl party. Oh well. Better late than never. Yea, but then you would have had to share! Once you try this chili, you’ll never make another, and you’ll want to hoard it all for yourself! Enjoy it Teeny! I like the way you think! I’m totally on board with that. Oh wow! I’ve seen you make this kind of chili before. Had me drooling then, have me drooling now. Looks great. 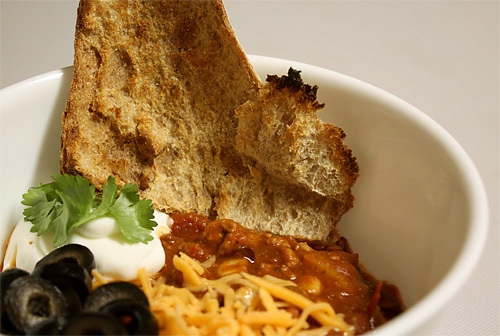 It’s the most drool-worthy chili out there! I have used a version of this recipe for over a year and fall in love with it every time I make it. Peanut butter and pumpkin puree are genius ingredients! I will never make a batch of chili without adding them! I couldn’t agree more Tess! Anyone who eats it can’t necessarily pick out those ingredients but they definitely contribute a lot to the overall flavor and texture. It’s unbeatable. I am laughing out loud! Well, of course…. So I rounded up all the ingredients that I could find to make this chili. Sadly I couldn’t find a Carrol Shelby chili kit, so I used a McCormick’s chili mix for the crock pot, since that’s how I’m doing it as suggested in the comments. I’m just curious as to why the black beans were left undrained? I typically drain and seriously rinse my beans since I try to cut back on sodium when I can. Does it do something to enhance the sauce? Just wondering. And I just realized that I misread the recipe and in addition to the chili packet, I added Tablespoons of all chili powder, cumin, and the ancho chili powder. Hoping that won’t ruin it and we do like spice. Thanks for sharing the recipe, and I can’t wait to try it. Hey Nancy, sorry for my late reply! Any chili mix will do, the variation between them isn’t major. The black beans are left undrained to add liquid to the chili. You could drain them and simply add some water, but it won’t have the same flavor. My recommendation would be to get the can of “no sodium” black beans (I know Goya has them) if you’re concerned about sodium levels. Also, the chili packets usually come with a salt packet – just don’t add it. In fact, every ingredient you use, try to get it with lower salt. You can always add salt back at the end. So – did you make it yet? What did you think!? This was AMAZING! I added a full cup of PB instead of half. And used both ground & stew meat cut VENISON. My friends said ot tasted like fiesta dip. Awesome, glad you liked it! Full cup of PB was a good choice – I’ll try that next time. I’ve used buffalo but not venison yet. Sounds delicious! Has anyone done this in a crockpot yet? How did you do it and how did it turn out? I’m going to try it tomorrow looking for some insight. Hey Travis, it works great in the crockpot! The only thing you will notice is that you may get some burned bits on the bottom of the crockpot. 2 ways to avoid this: stirring or cooking for less time. I’ve done it for 8 hours on Low without stirring and it had a crust of blackened stuff on the bottom (which, by the way, didn’t taste bad, just made the chili a little “ugly”). So I would recommend just cooking it for 4 hours on Low and possibly stirring half-way through, if possible. Besides that, the flavor is still excellent! Let me know how it works out for you. When you say 1 green pepper and 1 red pepper … what kind of peppers are you referring to? Bell peppers? Jalopeno/other kinds of chili peppers? Buying the ingredients tonight. Thanks! Sorry I forgot to respond yesterday! Yes, bell peppers! Good catch, I’ll update the recipe. Did you wind up making it? How did it come out? I’m making it for a work event on Friday. I’ll let you know! Thanks for the clarification. Just got second place in the “non-traditional” category. Apparently the judges either LOVED or HATED it. So, a less polarizing hawaiian chili won. Hey – we tried! Great job Clare! Sorry for another question. Is that 2 cans crushed tomatoes for a total of 28oz or 2 of the 28oz cans of crushed tomatoes? Hah no problem Clare. Two 28oz cans, 56oz total of crushed tomatoes! It’s ok if they have added garlic or Italian seasonings. Manic Monday! » What’s For Dinner?